The A-Frame Garage saves you valuable scraping and vehicle clearing time, while extending the life of your vehicle. Store your vehicle indoors with our A-Frame Garage. This structure is large enough to store a four-door truck, and is more convenient than building your own garage. 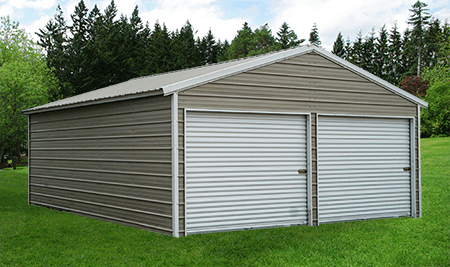 The A-Frame Garage comes with our modern peak and vertical metal on roof. If installing a roll up door on a sidewall a header is required, increasing the price of the roll up door by $100 & require legs to be 1′ taller than door.